Site page allows you manage all sources under the particular site. Only advanced buyers have an access to this page. The page contains site name, logo, description and preview link, as well as the name of the campaign selected on the previous page. 1. Source ID - the ID of the source that consists of site ID, publisher ID and the last 3 characters of sub ID. 2. Type - the traffic type of this source configured in publisher settings. 3. Available leads - the number of available leads from this site in the campaign vertical. 4. Leads - the number of leads bought from this site during the selected period. The next 9 columns are based on uploaded disposition data. Some of them are not displayed by default and can be selected in column settings. If on of disposition status was set as a goal in campaign settings, the corresponding column is marked with green (Appointment column on the image above). 5. New - the number leads with New status uploaded in disposition files. 6. Contacted - the number leads with Contacted status uploaded in disposition files. 7. Interested - the number leads with Interested status uploaded in disposition files. 8. Quoted - the number leads with Quoted status uploaded in disposition files. 9. Appointment - the number leads with Appointment status uploaded in disposition files. 10. Sales - the number leads with Sale status uploaded in disposition files. 11. CPA - calculated CPA based on disposition files uploaded. Check details about CPA in Buyer Performance Report. You can pause/unpause or prioritize/deprioritize sources. For direct post campaigns, you can also edit payout rules per each source. You will be redirected to Payout Management of this campaign. Make sure you don't pause the relevant site for the campaign. 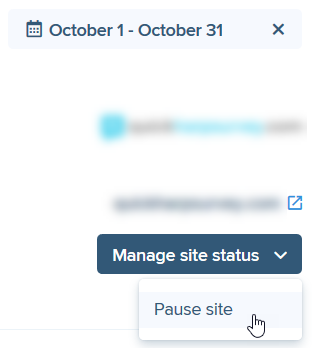 Site pausing has the highest priority and you won't receive any leads from sources related to the paused site, even if they were prioritized.